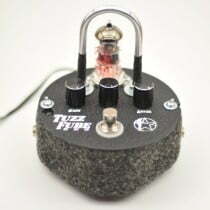 This tube fuzz pedal uses a fuzz circuit with a tube instead of the usual clipping diodes. How does it sound? Check out the video below. Although it can overdrive inputs with up to 15 volts (! ), it’s been tamed to safely drive tabletop instruments.